D-Sys is always in the market for hiring passionate, smart and extraordinary individuals to help bring us to a higher level of success. At D-Sys, you will work with some of the most skillful and talented people in the industry, working together to produce the most exciting and challenging projects in the world. If you share our goals, and are skilled in one or more of the following areas, we want to hear from you. Dashboard contains full features of everyone involved in College activities which helps management to keep them aware of all the things happening in their academic system. This module is available for all four phases(Admin, Lecturer, Student& Parents). Based upon the user credentials, this module displays the needed and useful information. Registration Management Module facilitates the whole student registration process in a simplified way. Student profile information –parent information,address information and academic information and other info is keyed in upon registration. Based on the above information and successful registration, this module will provide a user id/password for login purposes. Flexible and powerful Tool: Attendance module will help you to manage this important aspect of College administration: Simple interface for quick capture Attendance can be taken by course or by class By using Bio metric device Manually Attendance reports can be sent to parents by SMS (text message) Absent reports are immediately available to parents via the parent portal Attendance status and validation can be customised. Admission slips, Character Certificate, Transfer Certificates, Bonafide etc. can be customized and generated in College premises. Hostel Management has the facility to create multiple Hostel Blocks, Rooms, Capacity and facilities in the rooms.This module is used to manage hostel information of both student /staff such as allotment of the room, transfer the hostler from one room to other room.This module also manage Fees info regarding particular student/staff. This module also checks room information such as vacant room ,room capacity and present status of room. In each and every room some of the facilities are available along with the rooms. At the time of room allotment these facilities can acquire to avail with the room. Transport Master module is a complete internal transport management system. The system does route assignment for students based on their Pick point-sand maintains the trip details of the student and vehicles much more comprehensively. Transportation management module includes vehicle name, route details, transportation fee, etc. Transport fee collection is quite easy and is by a predefined structure. Transport module is also integrated with the fee management module and accounts so that the transport charges are automatically reflected in the accounts part as an add on to the fees. In admin part, admin can add /manipulate the routes and transport charges. The examination master is most important academic activity to evaluate the student ability and performance. D-Edu includes a wide-range of processes from exam timetable arrangement to creation of progress reports of students. Exam management modules include exam time table creation, marks entry, CCE report generation and final result display of student. 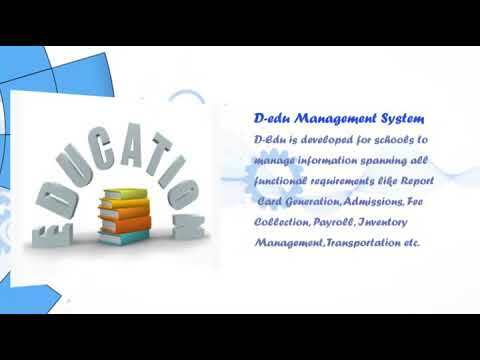 The D-Edu management software provides a series of examination procedures just by following simple steps like exam time table creation, marks entry, CCE report generation and generate final result. Exam management module is very helpful to Lecturers especially for the updating students’ marks, remarks and generate various reports in bulk section which reduce time and paperless work. Billing is always a time-consuming project, but one that certainly cannot be ignored. You have to keep track of numerous types of fee and then apply them to the correct students, manage incoming payments and receipts, and making bills and sending notices when bills are due. D-Edu’s Fee Management can help you streamline the process so that it doesn’t get out of control, or consume more time than necessary. Apart from being automated, at the same time, flexible enough to accommodate the varying nature of fee payments that most of the institutions come across. Fees Calculation is done on the basis of category selected for the student. The Module automatically calculates the pending fees payment details. In addition to the above, the user is also provided the option to allow payment of more than one month/Fee-cycle whichever applicable.